Now that she's beat breast cancer, Sentara patient Patricia Malley plans to help her medical team with new patients. The following content is created in consultation with Sentara Healthcare. It does not reflect the work or opinions of NBC Washington's editorial staff. Though she's in her 70s, Patricia Malley certainly doesn’t act her age. The Prince William County resident lunches with girlfriends nearly every day, takes a cruise once a year and dresses exclusively in head-to-toe glitter. What else do you expect from a former workout instructor who—when her military husband was stationed in Libya—once hosted a TV talk show called “People and Books” that featured visiting dignitaries like silver screen legend Carroll Baker? But when Patricia was diagnosed with breast cancer in March of 2014, the free-spirited seventy-something finally thought she’d met her match. 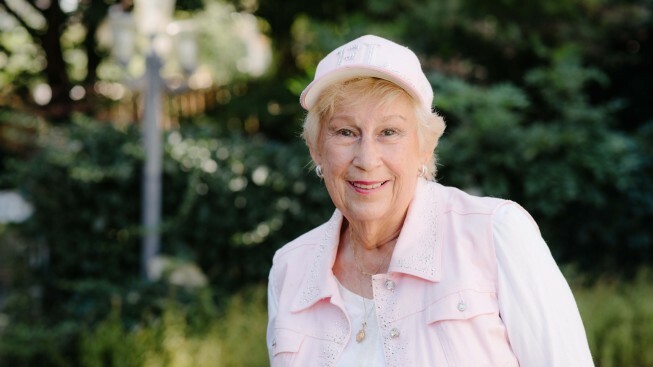 “You freak out when they say ‘cancer,'” Patricia says, recalling how a 3D mammogram at Sentara Northern Virginia Comprehensive Breast Center revealed a tumor that might have gone undetected had her healthcare provider relied on a more traditional test. Thankfully, Patricia’s worries subsided as soon as she met with her Sentara team, who quickly laid out her odds and the most effective treatment options. Beyond having some of the world’s best cancer technology and minds behind her, it was this individual care of each member on her team that boosted Patricia’s confidence and eased her mind. Having lost two older sisters to breast cancer, Patricia was wary of chemotherapy. But knowing that such a strong team had her back gave her the confidence to opt for the full treatment. After her initial consultation with her surgeon, Dr. Golesorkhi, Patricia underwent chemo and 35 radiology treatments, emerging cancer-free in February of 2015. It’s a success story that Dr. Golesorkhi attributes largely to Patricia’s enthusiasm and her willingness to face her disease head-on. Perhaps the most invaluable member of Patricia’s team was her nurse navigator, Julie Pierce, who broke her diagnosis down into easily understandable terms and walked her through every step of the process. Julie—like everyone on Patricia’s Sentara team—was available throughout her entire treatment, remaining in constant contact with the patient and calling her back that same day if she ever missed her call. In fact, Patricia and Julie became so close they still remain in contact today. Not only did Patricia have the support of Sentara, but she also benefited from having her three children by her side. While her son lives out of state, Patricia’s two daughters—Katherine and Teresa—live near their mother and accompanied her throughout the chemo and radiation process. Now that Patricia is healthy and cancer-free again, it’s back to business as usual. She celebrated with a week-long trip to Savannah with one of her daughters, and she resumed working out and lunching with the ladies. But she’s also intent to give back. Knowing that not everyone is as fortunate to have a family behind them, she plans to work with Julie and the rest of her Sentara team to help newly diagnosed patients. At Sentara Northern Virginia Comprehensive Breast Center, compassion is paired with advance technology. Not only are 3D exams standard in mammograms, but some diagnosed patients can be candidates for Intra-Operative Radiation Therapy (IORT), an advanced, 10-minute treatment that delivers an entire dose of radiation to the tumor bed without exposing nearby healthy organs to radiation. To learn more about Sentara Northern Virginia Comprehensive Breast Center and their advanced treatment options, click here.